Delaware Speedway is one of Canada’s leading short track racing venues. As a natural amphitheatre, there is not a bad seat in the facility. 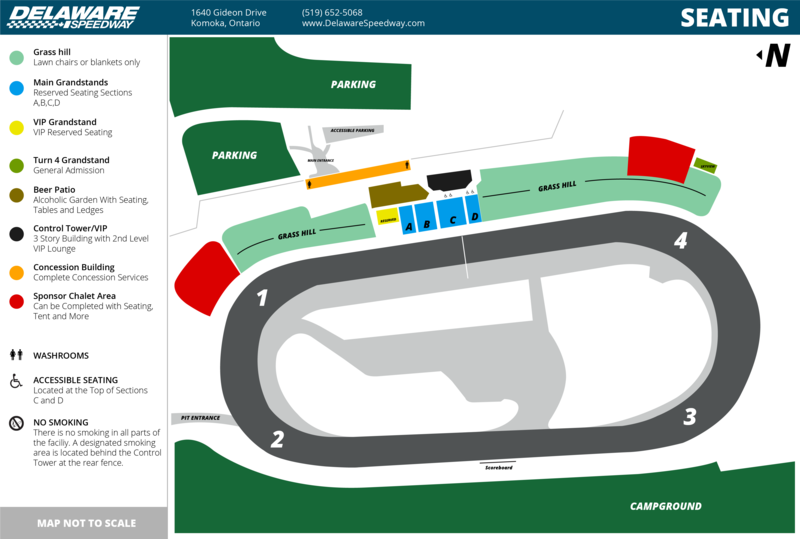 Have a look at our facility map to learn where things are and pick your favourite seat before you even arrive! Washrooms are located at either end of the main concession building. The women’s washroom is located to the right of where guests enter the venue (looking at the track), and the men’s is located at the opposite end. The women’s washroom has recently been renovated, as well as the men’s which received a complete overhaul after the 2016 race season. On either side of the grandstands, lawn chair seating on the hill is available. Simply bring a chair or blanket and setup where you like! All seating is general admission with the exception of the reserved seating section. Enjoy our brand new main grandstand on the front straightaway with stadium style seats!